To celebrate, we’ve revisited the best machines, kit and gadgets of the year. I now want to put a deposit on a Kawasaki Z900RS, need a Venhill pressure gauge in my toolkit and know that a Lomo rucksack is the most waterproof money can buy — and it’s just £30. You may also notice a bit of a change: I’ve taken over as editor from Simon Weir, who’s left to travel the world — though you will still see his large yellow helmet popping up here and there. Running RiDE is my dream job — I picked up my first copy over 20 years ago and loved its lack of bias, its usefulness and the most thorough testing in the business. That’s not going to change. 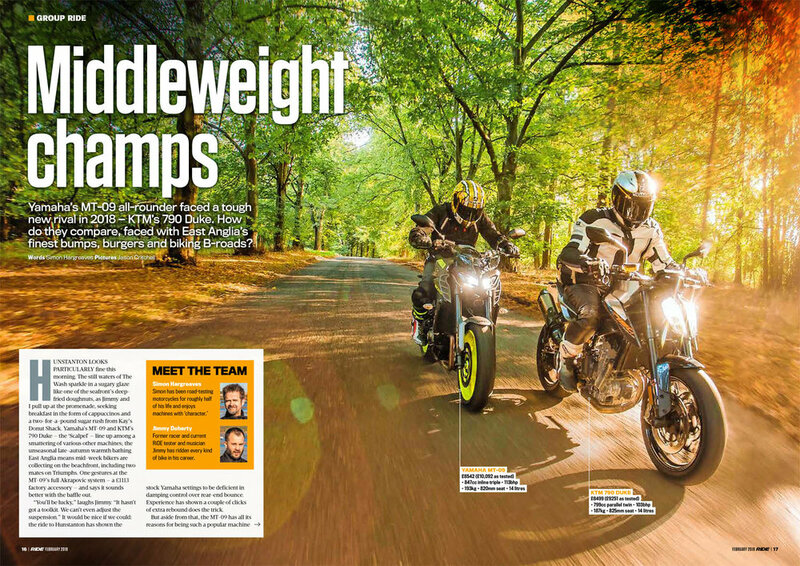 Yamaha’s MT-09 all-rounder faced a tough new rival in 2018 — KTM’s 790 Duke. How do they compare, faced with East Anglia’s finest bumps, burgers and biking B-roads? Triumph’s entry-level modern classic balances low stress with classy looks. Does more power spoil it?